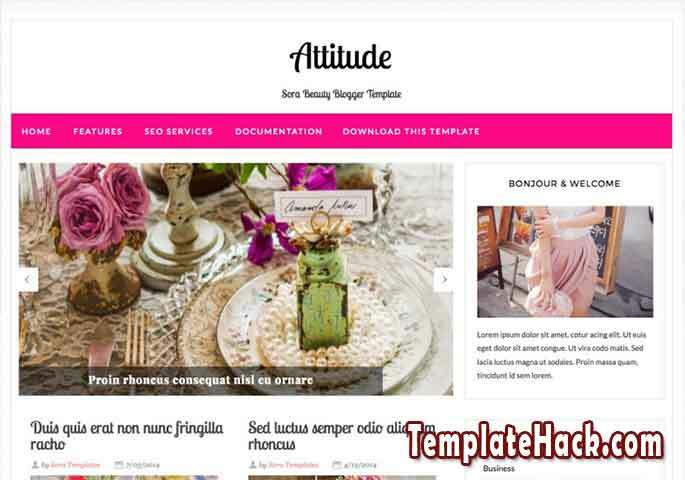 TemplateHack.com - Download Attitude Magazine premium blogger template. Attitude is firly magazine blogger template with pink base color. It is free blogger template to share your girly content like fashion, make up, wedding, love, lesson, recipes, lipstick, dress, and any other. I want to share this great template for you. Just follow the Download button link bottomto get full version of this template. Girly, Responsive, SEO Friendly, Widget, 2 column, 1 right sidebar, Featured post, Navigation menu, Dropdown menu, Post thumbnails. Magazine blogger template, News blogger template, Wedding blogger template, Lifestyle blogger template, Fashion blogger template, Portal blogger template, Food blogger template, Recipes blogger template.